1. 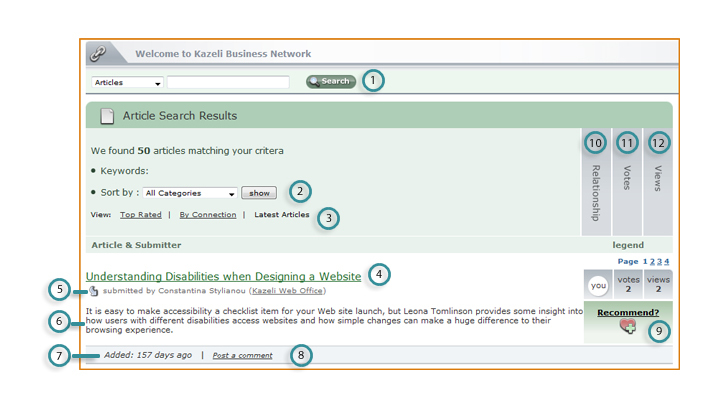 Search: Type in a search query and click Search to find relevant articles. 2. Sort by: Select a category from the dropdown list and click Show to view all articles for the category. 3. View: Select which articles will appear at the top. This will put the articles with the most recommendations at the top. This will put the articles which are submitted by companies or people with whom you share the most direct connection at the top. Will list the most recent articles at the top. 4. Title: The article’s title. 5. Submitted by: The person who submitted the article and the organization to which they belong. 6. Articles Description: Brief description of what the article is about. 7. Added: The number of days since the article was added. 8. Post a comment: Click here to post a comment relating to the article. 9. Recommend: Click the icon if you like this article and would like to recommend it as useful or interesting to other KBN members. Remember, the more recommendations the article receives, the higher it will be placed depending on the search criteria. 10. Relationship: This column shows the relationship of the connection to you. You will mean that the submitter is either you or somebody from your organization. 1 will mean you have a direct connection with the submitter on the Kazeli Business Network. 2 will mean that the submitter is a direct connection of one of your direct connections. 11. Votes: The number of recommendations the article has received. 12. Views: The number of people who have viewed the article. 1. Click on post a comment (8) at the bottom of the article listing. 2. Type in your comment in the space provided and click Submit. You cannot edit your post after submitting. Lively debate is encouraged, but please respect your fellow members by not posting obscene or derogatory comments.